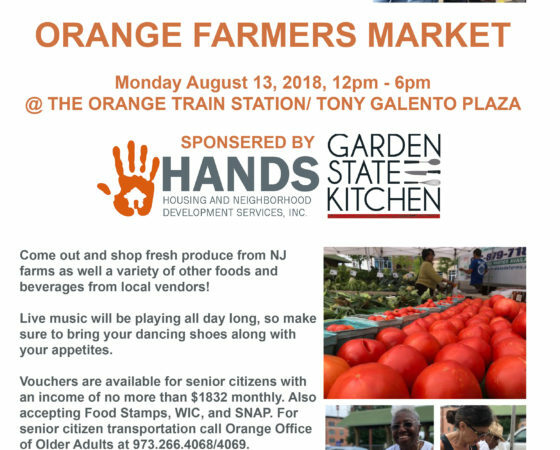 Orange Farmers Market, It’s Coming Back! Home / Blog / Orange Farmers Market, It’s Coming Back! Come out and shop fresh produce from NJ farms as well a variety of other foods and beverages from local vendors! Live music will be playing all day long, so make sure to bring your dancing shoes along with your appetites. Vouchers are available for senior citizens with an income of no more than $1832 monthly. Also accepting Food Stamps, WIC, and SNAP. For senior citizen transportation call Orange Office of Older Adults at 973.266.4068/4069.